A print and PDF copy of Freeport: The City of Adventure. You also get PDFs of the Fiery Dragon Counter Collection Gold, Freeport Trilogy: 5-Year Anniversary Edition (3.5 rules), Fiery Dragon’s Summoned Monster Counter Collection, Dark Wings Over Freeport(3.5 rules), the Player’s Guide to Freeport, and the poster map of the city. Bonus: You also get a degenerate serpentman miniature! 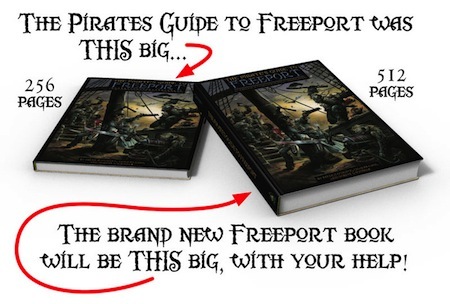 Bonus 2: You get all six parts of the Return to Freeport PDF adventure series as they release in 2014! Bonus 3: You get a PDF of the forthcoming Dark Deeds in Freeport adventure from our friends at Kobold Press. Bonus 4: You get two paper ship model PDFs from Fat Dragon Games, the medieval cog and The Sea Dragon. Bonus 5: You get a book plate with art by John Kovalic of Dork Tower fame and signed by Freeport creator Chris Pramas. Bonus 6: You get PDFs of not only the Pirate’s Guide to Freeport, but also ALL the rules companions: Castles & Crusades, FATE, Pathfinder, Savage Worlds, 3rd Era, and True20. That, me hearties, is a lot o’ loot! As of this post, the Kickstarter is at $47,942. Will you be the one to bump it over $48,000? Or over $50,000? Let’s find out, shall we? And, we’re funded at $50,088! You guys are so awesome. Now, who’s up for helping us get that shiny new Wayne Reynolds cover? Ronin Roundtable: Deal Your M&M Game a Wild Card New Stretch Goal: Advanced Bestiary!